Did you know there is a distinct connection between mastoiditis and hearing loss? Mastoiditis is a bacterial infection of the mastoid air cells surrounding your middle and inner ear. Your mastoid bone is a component of the temporal bone of your skull and is full of air cells. These air cells are believed to help regulate ear pressure, protect the delicate structure within your ear, and potentially protect the temporal bone in the instance of trauma. Once air cells in the mastoid bone become inflamed or infected — usually as a result of unchecked ear infection — mastoiditis can begin to develop. Due to the fact several vital structures pass through the mastoid, the infection can easily continue outside of the mastoid bone and cause more serious health conditions, including hearing loss. 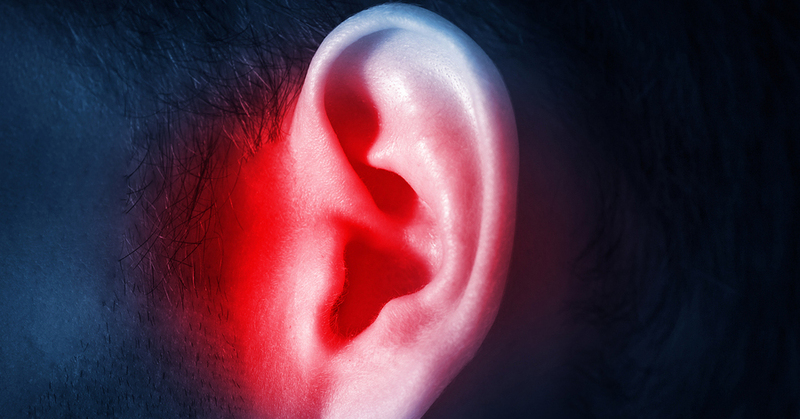 Let’s take a closer look at the connection between mastoiditis and hearing loss. As the condition continues to worsen, the pain may wane and wax throughout the day and the pus will become creamier. You may also experience swelling behind your ear. Fever can vary, but will typically increase as the pressure and pain association with the condition worsens. If you are concerned that your child is suffering from an ear infection or have been diagnosed with an ear infection that doesn’t seem to go away, it’s vital to contact a health care professional. If you notice one ear “sticking out” or observe swelling or redness on the skin behind the ear, these may be signs of mastoiditis. It’s important to consult with your primary care physician or a healthcare professional. Can Mastoiditis Cause Hearing Loss? Because your facial nerve runs through the mastoid, the affected side may suffer from facial paralysis. This condition can also cause cholesteatoma and eardrum membrane perforation if left untreated. Fortunately, hearing loss from mastoiditis and other severe complications are very rare. Once your physician has conducted an exam, they will likely use a CAT scan to determine whether the mastoid infection will respond to the antibiotics. These antibiotics are likely to be eardrops, antibiotics, or consistent cleaning of the ear. If you suffer from acute mastoiditis, the treatment may be conducted in a hospital — where you’ll receive antibiotics through IV. In rare cases, a surgical procedure may be required to either drain your ear or remove your mastoid bone. The process of draining the ear is called myringotomy, which works by creating a tiny hole in your ear drum to allow fluid to escape and release the pressure. On the other hand, the procedure for removing your mastoid bone is called cortical mastoidectomy. As a last resort, this type of surgery will only be used if the infection is severe and has progressed. If you do have a severely infected bone that isn’t removed, it can develop into brain abscesses or blood clots — both of which can be life threatening. If you believe your child’s mastoiditis has caused hearing loss, the hearing experts at North Shore Hearing P.C. can help. We offer a full range of hearing services for adults and children designed to help you hear and experience your world more clearly. Contact North Shore Hearing today to schedule a free hearing screening.